Choosing the best gas grills comes down to price, warranty, the cooking area, durability, and the ability to cook food evenly. The best models are often made of cast aluminum and stainless steel, with porcelain-enameled cast iron cooking grates. Prices vary greatly based on the brand name, the size, and other features of the grills. It has 507 square inches of cooking space, 130 square inches of warming rack, three stainless steel burners, a side burner, enclosed cart, and it's made of painted steel (body and frame). It's available in black, copper, and green. This grill was voted best overall by ConsumerSearch.com based on ease of assembly, durability, even heating, excellent warranty and customer service, and porcelain-enameled cast iron cooking grates. Seventy of 79 reviews on Amazon.com give it five stars. This stainless steel and cast aluminum grill gives a total of 520 square inches of cooking space, including a side burner, and has porcelain-coated cast-iron cooking grids, plus a thermometer with an internal probe for getting the correct temperature as you cook. It utilizes a Flav-R-Wave system that keeps flare-ups to a minimum. The grill is 51x21x49 inches. The price is lower than some of the other models, so if you're on a budget but need a good quality gas grill, this one may suit your needs. This grill has a large cooking space, limited lifetime warranty, and Amazon.com reviewers give it four of five stars. This grill does it all--it roasts, grills, fries, boils, and more. It's 49x62x25 inches and offers 700 square inches of cooking space. It has porcelain-coated cast iron cooking grids, precise temperature control, and lights quickly and easily. There are condiment bins for easy access. The grill is extremely versatile and comes with a limited lifetime warranty on cast aluminum parts, a five-year manufacturer's warranty on the stainless steel parts and burners, and everything else comes with a two-year warranty. According to the ConsumerSearch.com review, it is easy to use and has a large cooking surface, 280 square inches, and a removable catch pan for easy clean-up. It's durable and has porcelain-enameled cast-iron grates. Its body and lid are made of cast aluminum. 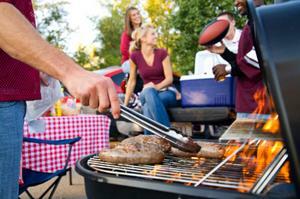 It is expensive for a portable, but is still much less than several other top gas grills. This is one of the best gas grills according to ConsumerSearch.com thanks to its low price and portability. This grill has four stainless steel burners, a side burner, a warming rack, bottle opener, and utensil holder. It's relatively inexpensive, especially when compared to Weber models. Cooking space is 502 square inches with 130 inches of warming rack space. It's only available in black. ConsumerSearch.com calls this the best gas grill on a budget and mention its many features as a great selling point. They also list it as easy to clean, easy to assemble, and good at cooking evenly. The warranty is only one year for most parts, but you get five years on the burners and three years on stainless steel parts. Because of the shorter warranty, this grill ranks lower than the others.